A remote and historic fishing village, Winter Harbour is situated on the at the end of one arm of Quatsino Sound. It's accessed by a rugged logging road via the town of Holburg, but the community of Winter Harbour remains a remote destination and natural paradise. The mainstay industry of Winter Harbour is fishing, and tourists can also enjoy a day of fishing for Halibut, and many other deep sea species of fish. Halibut on the wharf in Winter Harbour, Quatsino Sound, Northern Vancouver Island, BC, Canada. 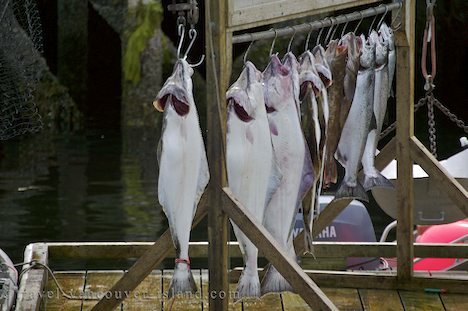 Picture of a good catch of Halibut on the wharf at Winter Harbour, Northern Vancouver Island.